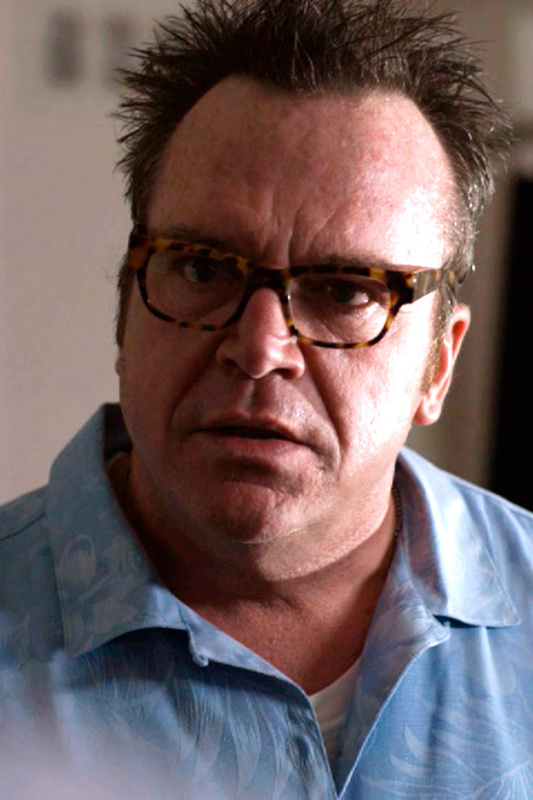 Tom Arnold in RESTITUTION, a film directed by Lance K.R. Kawas. Courtesy Monterey Media Inc. © MMXI RESTITUTION, LLC. All Rights reserved. Rated: R for strong violence, language and sexual content. In a picturesque city on the shores of Michigan, a series of mysterious murders has an unlikely but common thread -- Bryan Spikes, a hired insurance fraud investigator who gets more than a paycheck when he is inexplicably killed and then framed for the crimes. One year later, Alex Forrester (Mark Bierlein, Street Boss) arrives in the city claiming to be a writer researching the case. But as he begins uncovering the shocking truth behind the murders, his informants turn up dead, and he soon learns he may be next. 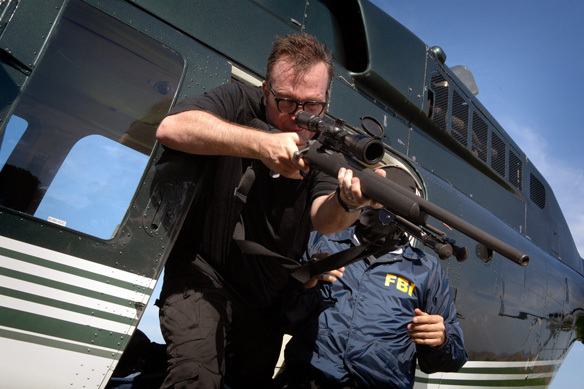 It seems there is no-one he can trust; including Bryan's ex-girlfriend Heather (Mena Suvari, American Beauty) and a new overly-friendly ex-sharpshooter neighbor (Tom Arnold, True Lies). The deeper he digs, the more his life, and Heather's, is in danger. What is the secret in this city that everyone is hiding? What is Alex's link to Bryan? He must now set the record straight, not only for restitution, but for revenge. It was an unusually cold 2010 May morning in Detroit when we first rolled camera for Restitution. Sporting a winter coat, and a wool scarf though was the least of my worries. This would be my forth feature film with the biggest stars I have worked with, and using two camera's for the first time. It was another rare and exhilarating opportunity to direct another film. To try and live up to my greatest inspirations: Godard, Fellini, Malle, Bergman and Kazan. And not to let down Hitchcock, Hawks, Griffith and Eisenstein. But was I dreaming? This is an independent film. Riddled with a menu filled with all the horrid dishes that capsulate the struggle of indie filmmaking. The confluence of so many energies that one hopes will come together and make a motion picture. And in Detroit. I wanted it all. But, as in always, there was a bullet wound that had struck both Mark and I. Something that all of this was nothing in comparison to the fact that this was the hardest picture for me to make thus far. Not because of the above, but because of the painful issues that came to be to bring this film to life. I say painful because up to the day before principle photography, this picture would not have been. the town to rescue it from itself, and himself, and to free the girl. Why? That is why you should watch it. When the time came for the actors to act, I pushed each scene as far as I could to get what I wanted in the most efficient way. Twenty days of rain wind, and cold. It was difficult. All the way to post. But it was as always, a privilege. There was nothing but panic, despair, and anguish, in the weeks before and until the day of filming. This all because of the ever so hard to attain -- film money or film financing. The company we were depending on to help fund the film did not perform, and yes they got paid for services rendered. I say it was unearned. There it was that bad taste that it left and it still lingers. As such, Mark and I were left with either pulling the plug after we have already brought in Line Producer Mark Mathis (Precious), opening a production office, hiring key staff, and making offers to actors, or finding money quickly and save the film. Ah the embarrassment, not to mention the financial loss for Mark. Welcome to the world of independent film. One thing the public must know about me, is that I have a very low tolerance for confrontation. Whereas Mark is the opposite. Mark is a man of his word. Meaning, if he says the film will be made, then by God it will. His word is gold. Unlike the company that was supposed to help fund the film. The stress that they caused will not be forgotten. The cold weather that was bestowed on us for this production will not be forgotten either. The rain and wind mired our days. So we persevered, and Mark called me the night before production and told me that we are on. The funds were from a private source and that is all I needed to know. The crew stood tall, and we marched each day with valor and made our days. We all knew that post was to be key to match the climate that was so different from the previous day of shooting. But there was pleasure and laughter, and this is the magic of film. To make Tom Arnold cry and him writing to me about it after the fact, is perhaps one of the biggest compliments and I am thankful. Yes people, Mr. Arnold like never before pulls it off with grace. And I'm not talking little tears either. Who would have known eight months prior to this, I will be in such a situation. Working with C Thomas Howell was also a pleasure. I remember at a very young age seeing him in E.T., and The Outsiders. It was a feat working with Mena Suvari (American Beauty). She was experienced, professional, and yes she knew her lines. I respect that from an actor. But it was a blessing working with my friend Mark Bierlein. It was only his second film as an actor. Given the dire events that preceded the film, and the fact that he was not feeling well, Mark Bierlein impressed me and beat the odds. He rose to the challenge, and as always, he stuck to his character and performed gracefully. I am ever so humbled to be with such people and the amazing crew that fought so hard to shoot this film in twenty days. Only twenty? I can't believe it. My hat goes off to the crew. Thank you. It was an honor. I hope people will understand when they watch this film that it was done independently and for a low budget by two very regular guys who just love film. RESTITUTION was a story inspired by what I felt was the lack of fresh and interesting stories coming out of Hollywood. My goal was to create a compelling story that entertained audiences throughout the world, with good old fashioned storytelling and interesting characters. For an hour and forty minutes, we want people to check out of their lives, and be entertained. That's what movies are all about. I loved movies since I was very little. Since seeing Star Wars, I've been enamored with film. I loved the medium, it had everything, pictures, sound, music. I loved the theater experience, and I hope that people get a sense of that when they see this film. Movies are what I call "emotional roller coasters". You go on the ride with your fellow theatergoers. You laugh, cry, jump, scream, and root for a hero together. RESTITUTION is a complete independent film in every way, filmed in my home state of Michigan. 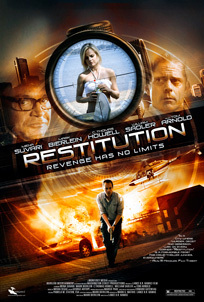 Tom Arnold, Mena Suvari and C. Thomas Howell star in RESTITUTION, a film directed by Lance K.R. Kawas. Courtesy Monterey Media Inc. © MMXI RESTITUTION, LLC. All Rights reserved. Mena Suvari in RESTITUTION, a film directed by Lance K.R. Kawas. Courtesy Monterey Media Inc. © MMXI RESTITUTION, LLC. All Rights reserved. Mark Bierlein and C. Thomas Howell in RESTITUTION, a film directed by Lance K.R. Kawas. Courtesy Monterey Media Inc. © MMXI RESTITUTION, LLC. All Rights reserved. Mark Bierlein and Mena Suvari in RESTITUTION, a film directed by Lance K.R. Kawas. Courtesy Monterey Media Inc. © MMXI RESTITUTION, LLC. All Rights reserved. 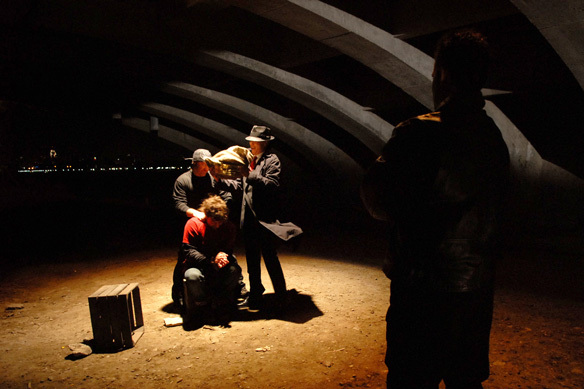 A scene from RESTITUTION, a film directed by Lance K.R. Kawas. Courtesy Monterey Media Inc. © MMXI RESTITUTION, LLC. All Rights reserved. It's the exciting and unpredictable world of thoroughbred horse racing... and no trainer loves his horses more and wins less than Dusty Sanders (Sean Astin).